Days are getting cooler, and I find myself making hot and hearty dishes such as rice porridge (also called congee) more often. Rice porridge is a popular dish in Vietnam, and you can easily come across street food shops selling it almost everywhere. I was going to write a rice porridge recipe today; then I realized I have a lot to talk about the basics and twists of cooking congee in general. 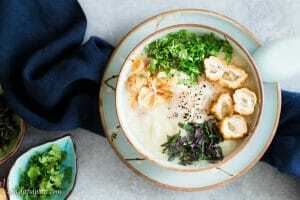 Therefore, I decided to write an overview of Vietnamese rice porridge and a discussion of how this simple dish can be prepared and customized in different ways. 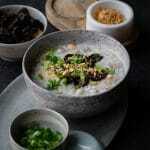 Rice porridge (congee) is a comfort food in Vietnam as well as other Asian countries. Its Vietnamese name is “chao.” The silky and creamy rice porridge is prepared by cooking rice in a large amount of water until the rice soaks up the liquid and softens significantly. Vietnamese people can eat it for breakfast, lunch, dinner or as a mid-day snack. One of the most common uses of congee is serving it to sick people because of several reasons. We consider congee as a light dish which is easier to digest than solid food. Besides, we eat congee with a lot of herbs which have soothing and healing properties. Lastly, rice porridge is a hot dish, so it helps to warm up the body and improve blood circulation. 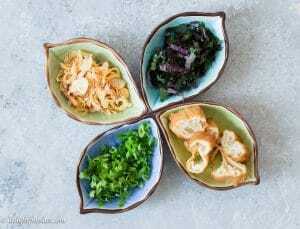 There are quite many types of rice porridge in Vietnam. When you change the protein or the cooking liquid, you basically make a new rice porridge dish. When I was a kid, I loved eating either pork rib congee (chao suon) or clam congee (chao trai) as an afternoon snack. I remember my watering-mouth just wanted to dig right in the bowl of hearty and creamy congee while my head was screaming: eat slowly or you will burn your mouth! Other popular types of congee in Vietnam are chicken congee, ground pork congee, eel congee, fish congee and lobster congee. Making congee is quite simple and straightforward. You just throw ingredients into a pot and cook until the rice softens and creates thick and creamy porridge. It’s definitely simple, but you will be surprised that you can prepare it in so many ways. Liquid: it can be plain water or broth. 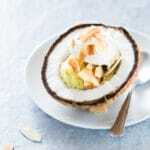 Protein: protein adds flavor to rice porridge. It can be a means to create broth while making congee or can be added later. Additional toppings: they bring interesting textures and flavors to the dish. Herbs: the aroma from herbs helps balancing the richness of rice porridge. We will visit each component in more details later in the post. In addition, it is a common practice to add ginger, shallot and/or garlic when we cook congee. Also, salt, fish sauce and plenty of black pepper cannot be missed. The traditional method is on the stovetop: combining all ingredients in a pot and simmering until rice turns into porridge. You can soak rice in water before cooking to reduce cooking time. I’ve seen people toasting rice with oil before cooking to give the congee a slightly nutty flavor (spoiler: this is not the only way to get the nutty flavor, keep reading to know more). The traditional method, however, isn’t necessarily the easiest one. In the case of rice porridge, I think the easiest way to cook it is to use a pressure cooker. The biggest advantage is shorter cooking time. Moreover, it’s way more convenient since you don’t have to check on the pot frequently. For example, when I make chicken congee, I just need to put some chicken drumsticks, rice, water, ginger, shallot and fish sauce in the pressure cooker, walk away and let it cook with high pressure for about 20-25 minutes. It’s been years since I last cooked congee on the stovetop. When I cook congee in my pressure cooker, the ratio of rice to water is usually around 1:6 to 1:8. Once the pressure cooking is over, I will stir and check the consistency and adjust to my liking. If it’s too thick, simply add some water. If it’s too thin, simmer a little more to thicken it. Speaking of pressure cooker, I highly recommend Instant Pot. It is a multi-cooker that can function as a pressure cooker, slow cooker, rice cooker and more. I have been using it for three years, and there hasn’t been a week when I don’t use it (well, except when I go on an extended vacation). I mainly use the pressure cooker and slow cooker functions to make broth and rice porridge. You can easily customize congee through different choices of rice, choices of liquid and protein, and choices of toppings and herbs. Let’s talk more about rice for congee. The traditional choice is Asian white rice such as Thai jasmine rice or Korean/Japanese white rice. I personally prefer Japanese/Korean rice because it’s starchier than jasmine rice, resulting in silkier and creamier congee. What if you only have jasmine rice? You can still make your congee creamier by swapping a small amount of jasmine rice with white sticky rice. I discovered this tip when my friend’s mom cooked pork rib congee for us using sticky rice and the congee turned out so rich and silky. I mentioned above that toasting rice before cooking is not the only way to give your congee some nuttiness. You can use a mix of white rice and brown rice to achieve that. The mix should be mainly white rice with the percentage of brown rice being under 30%. 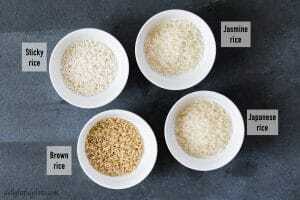 Brown rice takes longer to cook and doesn’t soak up liquid as much as white rice. Therefore you may need to adjust cooking time and amount of liquid accordingly. I really like this chicken congee with brown rice. In summary, we can use plain white rice to cook congee, or use a mix of white rice with sticky rice and/or brown rice to alter the texture and flavor of the congee. One more way to cook congee I want to mention is to cook it from rice flour. In Vietnam, we sometimes use rice flour to make pork ribs rice porridge (chao suon). Though the consistency is like… baby food which may sound unappetizing, it is actually very tasty. You can flavor rice porridge by using different types of broth and protein. Some of the options for broth are pork broth, chicken broth, fish stock and clam juice. As for protein, you have endless options, some of which are pork ribs, ground pork, chicken, and seafood. You don’t always need to make broth in advance. It’s possible to cook protein and rice in water together and protein will create broth during the process. Adding toppings is a great way to add textures and flavors to your rice porridge. My favorite toppings for congee are Chinese crullers/fried dough, fried shallot, and meat floss/meat cotton (ruoc). My Asian grocery store sells frozen pre-made Chinese crullers, so I just need to cut them into shorter pieces and bake at 375F for about 7 minutes until crispy. Fried shallot can be made at home or you can easily buy it at Asian grocery stores. These two types of toppings add crunchiness, making eating rice porridge more fun. Meat floss is chewy and salty, adding both texture and flavor to the dish. My favorites are pork floss and shrimp floss. Shrimp floss is easy to make and incredibly tasty. Instructions for making shrimp floss can be found in my Bun thang (Vietnamese chicken combination noodle soup) recipe. It would be a huge mistake to eat Vietnamese rice porridge with no herbs in my opinion. They bring so much to the dish: colors, aroma, flavor, texture and health benefits. The most common herbs for congee are scallion and cilantro. Then, based on your choice of protein, you can add herbs that particularly pair well with that protein. For example, Vietnamese perilla (tia to) enhances pork-based rice porridge and fish rice porridge significantly. So that is all I have to share with you with regard to cooking rice porridge for now. If you have other tips, I would love to know so please don’t hesitate to comment. I plan to post a Vietnamese rice porridge recipe later this week, so check back if you are interested. Update: here is my recipe for Vietnamese fish rice porridge.